Proper tools really make a difference when decorating a cake. Here is some of the equipment regularly used in the cake decorating process. Spatulas are used to ice cakes. An angled spatula is especially helpful and easier to use than a flat spatula for icing cake tops. 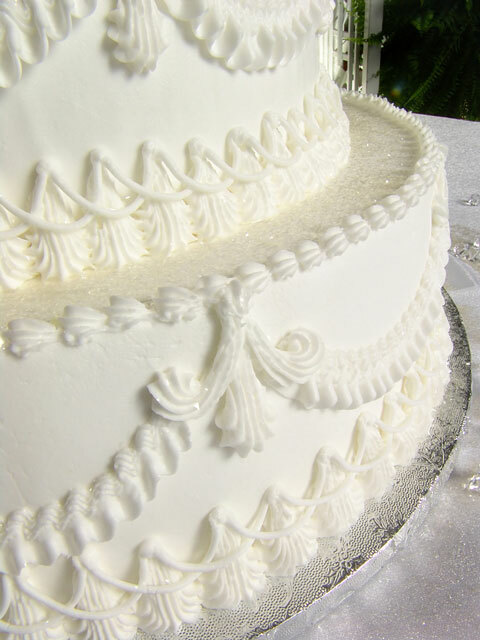 Plastic decorating combs or triangles are used to texture the icing on the sides of a cake. Decorating bags may be lightweight polyester or disposable plastic. Parchment paper triangles also may be used. Sizes vary and are chosen based on the amount of icing the decorating job will require. Couplers are two-part units that are used with decorating tips. The base part is placed in the bag, the tip is put on the outside of the bag, and the outside ring is screwed onto the base. Couplers are designed so that different tips can be used interchangeably with the same bag of icing. 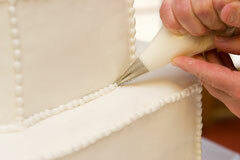 Decorating tips are metal tips that are open-ended and specially shaped to form different icing designs. A wide variety of tips are available. The basic tip types are drop flower, leaf, petal, round, ribbon, star, and star-cut. There are also some special purpose tips that are larger or form particular shapes. 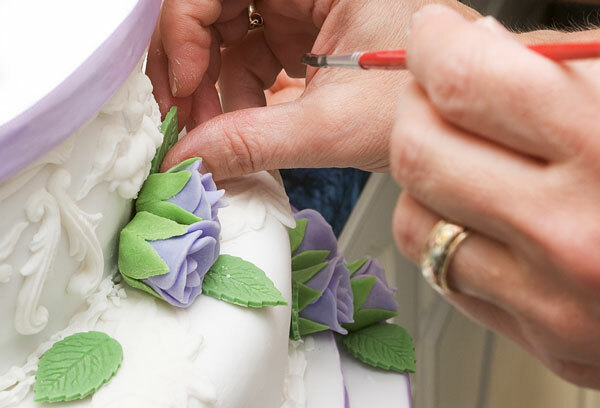 Illustrated at right is a wedding cake embellished with designs created using a diverse set of cake decorating tips. Small decorator brushes are used to paint details on the icing or to add color in decorating bags for multi-color effects. Flower nails are revolving platforms that you turn between your fingers as you build icing flowers on them. Flower nails come in several sizes, from 3 inches for large petaled flowers down to 1 1/4 inch for smaller flowers. There is also a lily flower nail, which is used to form curved, cup-shaped flowers. Rolled fondant icing calls for a variety of special tools. Rollers or rolling pins are used to roll out the icing, like pie crust. The icing may then be smoothed over the cake with a smoothing tool. All kinds of other tools are used to emboss designs and cut shapes for leaves and flowers. Confectionery tool sets are available for this type of cake decorating work. The illustration below shows rolled fondant icing flower petals as well as leaves that have been cut out and embossed.